It provides methods for detecting the midi devices and for connecting these devices with each other. The midibridge itself is considered a midi device as well, so it can be connected to the detected devices. The midibridge can generate and send midi events to midi output devices, and receive midi events from midi input devices. The midibridge can also filter and alter midi events. A sequencer for playing back midi files is implemented as well, recording will be added in a later version. A midi output device is a physical output port on your computer, a virtual output port or a software synthesizer. It can also be a sequencer, a file or a function. A midi input device is a physical or virtual input port, a sequencer, a file or a function. A midi device can be both in- and output. The midibridge itself for instance is both in- and output because it can send and receive midi events. The actual interaction with the midi devices on your computer is done by a Java applet. The midibridge automatically adds the applet to your webpage. The midibridge has no visual parts, it is ‘headless’ code. You could say the midibridge enables you to write a ‘front-end’ on top of the applet. 1) Download the zip file from Github. 5) Done! If you have a midikeyboard connected to you computer, play some notes and you’ll hear a piano sound. Also you will see that the midi events are printed to your console. The init method of the midibridge adds an extra div to the body of your html page, and in this div the Java applet gets loaded. After the applet has loaded, it detects all currently connected midi in- and outputs. Then it automatically connects all midi inputs to the midibridge. Also, the first found midi output gets connected to all midi inputs and to the midibridge. This way you can start playing your midi keyboard directly after the midibridge is initialized. When you play, the callback method that you have passed as an argument to the init function will be called. In the example above, the incoming midi events are only printed to the console, but i’m sure you can come up with something more funky. midiBridge.PROGRAM_CHANGE] this setting overrules the filter setting on MIDI connections, see addConnection(). In the example below all midi inputs get connected to the midibridge, but they will not be connected to the first midi output, i.e. you won’t hear a sound when you play your keyboard(s). Also, all messages from the midibridge are printed to a div in the html page. You can check this example here. Now if you click on “play a note”, you should hear a note. This method returns a JSON object that contains all midi devices that were detected on your computer when the midibridge was initialized. The parameter available shows whether the device is currently in use or not. For instance if your midi keyboard was connected to a softsynth at the time you started the midibridge, that midi keyboard will be listed but the parameter available will be set to false. You can use this method if your midi configuration has changed after you have started the midibridge. For instance if you connect a new midi device to your computer. If you call this method, all current connections between your midi devices between your midi inputs and the midibridge will be disconnected. By calling this method, all detected midi inputs will be connected to the midibridge. You can also achieve this if you call the init() method with a configuration object, and then set the key connectAllInputs to true. By calling this method, the first detected midi input will be connected to the midibridge. You can also achieve this if you call the init() method with a configuration object, and then set the key connectFirstInput to true. This method does not connect a midi output, so you can use this configuration for instance if your application only has a visual representation of the midi events. NOTE: Sometimes the first midi input is not the device that you actually want to connect. 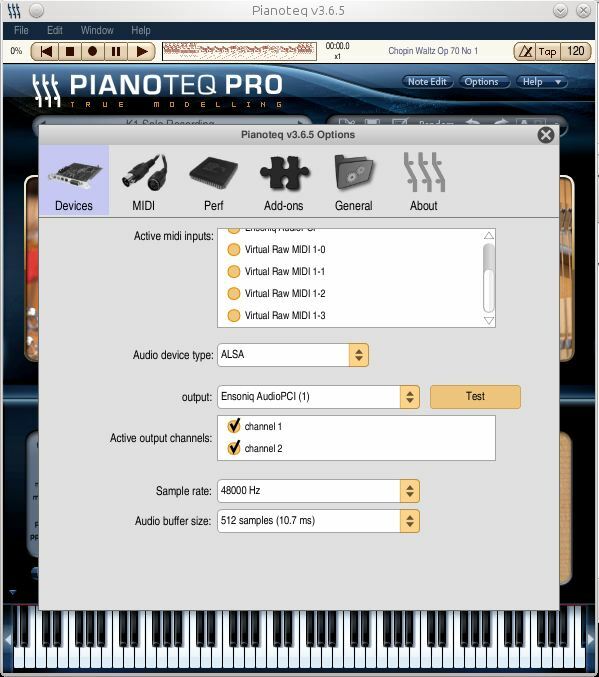 In this case use getDevices() to check what id has been assigned to the midi input that you want to connect to the midibridge, and establish the connection with addConnection(midiInputId,midiOutputId). This also applies to connectFirstOutput. By calling this method, the first detected midi output will be connected to the midibridge. You can also achieve this if you call the init() method with a configuration object, and then set the key connectFirstOutput to true. This method does not connect a midi input, so you can use this configuration for instance if your application has a virtual keyboard, or if you attach the regular keyboard to the midibridge. The spacebar is used for the sustainpedal. Pressing a sustainpedal is a control change event. The controller number of the sustainpedal is 64 and 127 means pedal down, 0 means pedal up. By calling this method, all detected midi inputs will be connected to the midibridge, and all inputs will also be connected to the first detected midi output. This is the default configuration of the midibridge, so you can also achieve this if you call the init() method with no arguments, or with a callback function as argument. addConnection(input,output,filter) You can set up a connection between any midi input and midi output device by passing the ids of the devices as arguments to this method. You can lookup the id of an device in the JSON object that is returned when you call getDevices() or refreshDevices(). The id of the midi input and the midi output can also be set to -1. 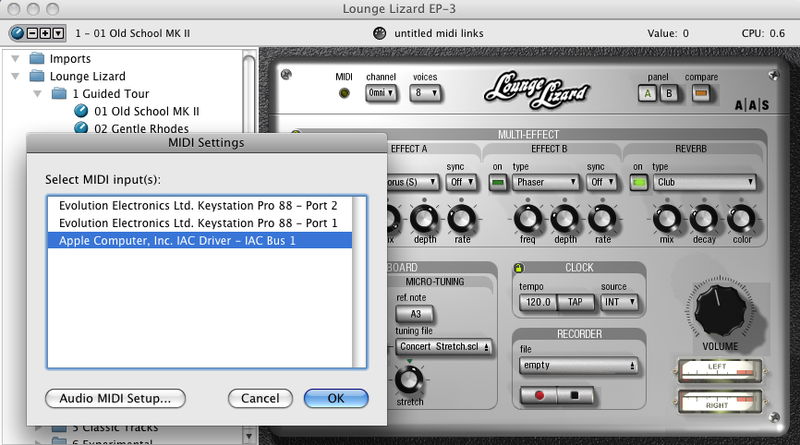 If you for instance only want to capture midi events in your application without connecting to an output device, you can set the id of the midi output to -1. If you set both the midi input and the midi outport to -1, nothing will happen. The filter argument is an optional argument that you can use to pass an array with midi message types (status codes) that you are not interested in. If a midi message of one of the specified types is generated by an external midi input, the message will not be passed on to the midibridge. You can specify the midi message types with a decimal number (224), a hexadecimal number (0xF0) or with a human readable midibridge constant (midiBridge.PITCH_BEND). In the example below pitch bend midi messages will be filtered. You can remove a connection between a midi input and a midi output by passing their respective ids as arguments to this method. Returns the name of the note based on the midi notenumber. Midi notenumbers are part of the midi standard and range between 0 and 127. The central C (261.626 Hz in 440 pitch) has notenumber 60. Returns the midi notenumber based on the name of the note and the octave. Octave -1 is the lowest possible octave number, octave 9 the highest possible. A regular 88 key keyboard ranges between A-1 and C7. Returns a string representation of the status byte of the midi message. For instance midiBridge.getStatus(midiBridge.NOTE_ON) returns “NOTE ON”. Loads a base64 encoded MIDI file in the sequencer and return an object containing data about the loaded MIDI file. There are several ways of getting a MIDI file as base64 string into your application. 1) By using html5 drag and drop functionality with the File API, see this example. 2) By using the File API, see this example. Same as loadBase64String(base64String) but the file starts playing immediately. If a MIDI file is loaded the sequencer starts playing the file at the current position. Pauses the sequencer. Note: pause does not toggle, so you have to call startSequencer() to unpause the sequencer. Stops the sequencer and rewinds sets the position of the file back to the start. Stops the sequencers and then closes it. You have to call loadBase64String(base64String) or playBase64String(base64String) to open a sequencer again. Gets the position of the MIDI file in the sequencer in microseconds. Sets the position of the MIDI file in the sequencer in microseconds. Converts microseconds to the time format m:ss:SSS. Typically used to display the sequencer position of the MIDI file. Returns a reference to the object in the html page whose id is specified. It is used for getting a reference to the applet, but you can also use it for getting a reference to any other type of object. For instance for getting the swf object if your application is built with Flash, see What about Flash? An internal class of the midibrigde that is used for storage and easy handling of the midi events that arrive from the applet. The applet sends midi events as JSON strings to the midibridge. The midibridge uses the native JSON.parse() method to parse this string into a JSON object. The MidiMessage class has 2 useful methods that you might need in your code toString() and toJSONString(). The first method is handy for printing the midi incoming events to a log, and the latter can be used if you want to send the midi event to Flash or another technology. See the offical JSON website for more information. Flash programmers might be interested in the JSON library of Mike Chambers. If you’re on Windows or Linux, the latency of the Java Sound Synthesizer makes it almost impossible to play. On Windows you can also choose the Microsoft GS Wavetable Synth and with some soundcards you may get a decent latency (i was told the Realtek AC97 perfoms pretty well). On a Mac you can just select a default midi synthesizer (Java Sound Synthesizer) and start playing with no noticeable latency. Latency is caused by both the drivers of your soundcard and the way your synthesizer works. Most modern softsynths hardly cause any latency, but even with the latest M-Audio pro cards you’ll experience latency when using the Java Sound Synthesizer or the Microsoft GS Wavetable Synth. So we need to be able to connect to some real softsynths like Pianoteq or Lounge Lizard and for this we need a virtual midi driver. If you’re on a Mac, you’re lucky because such a thing is already installed on your machine. It is called IAC Driver and you’ll find it if you open the Audio MIDI Setup in your Applications folder. Below i’ll give a brief explanation for every driver. Download it from nerds.de and run the installer. After the installation has finished LoopBe is up and running and will automatically start with Windows (if you don’t want this, run msconfig and remove the LoopBe startup service). Now LoopBe Internal MIDI will be listed as both a midi input as well as a midi output when you call getDevices(). You can setup a connection betweein your favorite keyboard as input device and LoopBe Internal MIDI as output with addConnection(). You should now be able to play your softsynth while midi data is passing thru the midibridge, and dependent on your soundcard’s driver, with very low latency. Please notice that LoopBe1 is only free for non-commercial use. For commercial use you need to acquire a license after a 30-day evolution period. But for only € 11,90 inc VAT it’s really a bargain. If you are willing to spend an extra 5 euro on top, i would recommend to buy LoopBe1 bigger brother LoopBe30, which gives you up to 30 virtual midi ports! Check here. Open your Finder, go to menu Go -> Applications and scroll down till you’ve found a folder named Utilities. Open the folder Utilities and double click on Audio MIDI Setup. If you only see a window with Audio Devices, go to Window -> Show MIDI Window. In the window that subsequently opens, you should see an icon named IAC Driver. IAC stands for Inter-Application Communication, and that is exactly what it does. Don’t worry if looks a little different on your machine. You should see at least 1 port in the “Ports” part of the screen. If not, simply click the plus sign to add a port. I recommend to add a least 2 ports to the IAC Driver. Close this popup and the Audio MIDI Setup. 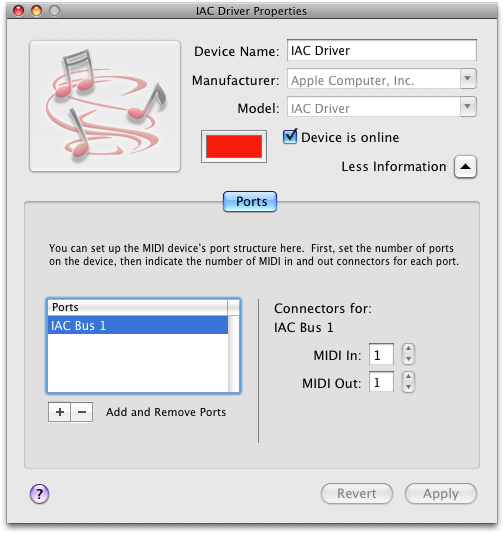 Now “IAC Driver IAC Bus 1” (or something alike) will be listed as midi input when you call getDevices(). Now you can play your softsynth while midi data is passing thru the midibridge. Because snd-virmidi is a kernel module, you can simply load this module by typing sudo modprobe snd-virmidi on the command line. Now if you call getDevices(), you should see at least 4 additional devices listed. 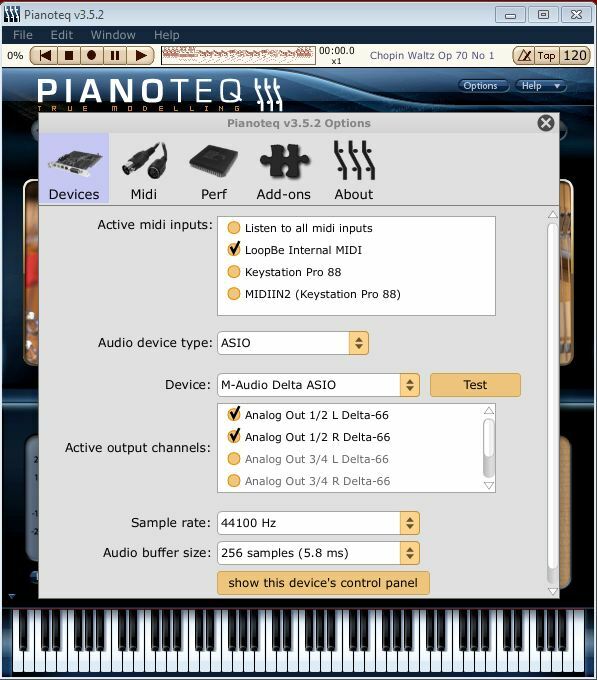 Pianoteq is available for both 32 and 64 bits Linux, so if you want to try it yourself you can download a demo version over here. version 2 : With all features of the proof of concept, but with an extra swf that sits between the applet and the application swf. This extra swf connects on one site via ExternalInternface to the applet, and on the other side via LocalConnection to the application swf. version 3 : The in-between swf removed again, dynamical sound generation replaced by midi out. A very simple GUI: virtual keyboard, chord finder and pich bend controller removed, simple animation added in. version 5 : Same as version 4 but you can also export the code to a standalone AIR version. In my blogposts you can still find information about the earlier versions. This might be confusing and therefor i have started this page where you can find only up to date information about the latest, and thus featured release. Some of this information can also be found in various posts, but if it appears here as well it is still valid for the current release. With this version, the development of all earlier versions of the midibridge will be frozen. The reason for this is that with this new version i have redefined what the midibridge exactly is. In former version of the midibridge i have added too much GUI functionality. As explained in the introduction, the new midibridge provides only a compact set of methods that allows you to interact transparently with the midi devices on your computer, but leaves the GUI totally up to you. So therefor the new version has no control panel, virtual keyboard, midi learn functionality and so on. I have provided code examples for the basic features of the midibridge and i will add some more examples for more advanced features like sound generation soon. Also i might develop some configurable UI plugins for the midibridge (alike jQuery UI) somewhere in the future. Another reason for stripping down the midibridge to its core is that former versions were too much tied to Flash and Actionscript. In modern browsers Flash is no longer the only reasonable choice for creating compelling animations. This applies to dynamically generating sound as well. What’s more, the latency of Mozilla’s Audio Data API allows you to set the minimal audio buffer as low as 512 samples, which results in a latency of only 512/44100 ≈ 11.6 ms(!). In Flash the minimal buffer size is 2048 (recommended) which results in an almost un-playable latency of 2048/44100 ≈ 46ms. The only downside is that the new version is not compatible with the earlier versions. However, you can still use it; the code is fully functional and remains available at GitHub and Google Code. You are encouraged to switch to the new version though. As i mentioned above, the earlier version had both a web and an AIR version. The Air version uses NativeProcess to start a Java program on the commandline, and communicates with this program via its standard input and standard output. The midibridge is fully accessible from Actionscript 3.0 if you use the ExternalInterface. You probably want to load Flash before you initialize the midibridge so you can show some loading animation. In Actionscript you have to test when the page has fully loaded and then call the init() function of the midibridge. * communication with the Flashplayer. * flashapp is the id of the swf object in the html page. * convert the arguments to a array, the first argument is the msgId. Currently the midibridge does not work with the Icedtea Java plugin on Linux. In a future release i will add more functionality to the sequencer. The following methods will be implemented. For more feature requests or other suggestions, please drop me a line! AWESOME !!! Very – very exciting thing. Did you use it anywhere ? Or it was just for fun ? I know this is something simple I am missing. Thanks in advance! default midi in: null -> There is currently no default midi device saved to a flash cookie (Shared Object). If you click “save settings” after you have selected a midi in device, this device will be automatically selected when you open the page next time. Of course, only if that device still is connected to your computer. Fluidsynth (internal) loaded -> The internal (built in Flash) software synth is loaded and active. If you press with your mouse on a key of the virtual keyboard, you should hear a piano sound. midi out set to -1 -> See previous point. But, ‘midi in set to -1’ [in bi-directional midibridge with fluidsynth event log] is an incorrect readout because I do have several USB MIDI devices connected (Axiom 25 and Trigger Finger). The pulldown menu for MIDI In devices is grayed out and it gives me no options for some reason. Clicking ‘rescan devices’ does not help. That is just in IE8. In FireFox and Chrome however “bi-directional midibridge with fluidsynth” works perfectly as soon as I start it. I see my MIDI In devices listed and I can choose them and they work well. Another indicator is that when I run your Test Applet it definitely shows my MIDI In devices as connected and as viable MIDI In devices. I just don’t know why “bi-directional midibridge with fluidsynth” in IE8 is not seeing those devices. What could be causing this just with IE8? Thanks. Sorry, i misunderstood your problem. I will look into it again. -> Do you have Service Pack 3 installed? -> What are your settings for Browser Mode and Document Mode? -> Do your midi in devices show up in the old version? – Yes I have Service Pack 3 installed. – I have tried with Compatibility View on and off. I don’t know how to check settings for Document Mode though. – My MIDI devices do not show up in the old version either. Thanks again for checking this out for me. What a great solution – very exciting! I made a custom hardware Midi-controller with arduino and I was hoping to use Midibridge to “teach” my controller’s CCs via a fancy flash GUI. I have the CS5 SimpleSampleAppWeb working/compiling fine but I don’t know what to do next. I would basically like to have a dozen buttons send midi notes from nearby editable textboxes when you click them. I’m eager to learn but I’m new to actionscript3. Maybe I could hire you for an hour to get me started? If you could drop a text box and a button to send it’s contents into a .fla file, that would be a great starting point. In the repository you can find a folder net/abumarkub/midi/learn/. This folder contains all necessary classes for midi learn functionality. There is also a sample app called AppWeb that has implemented these midi learn classes (in the folder net/abumarkub/app_midibridge/ ). You can use this code as a starting point for your code. Let me know if you run into any issues. Outstanding, so excited to integrate this into something cool. The classes are very clean, and documented well, kudos! Perhaps you could start a list on this page to showcase how it’s being used elsewhere. Thanks again! I am glad that you like the code because i have put a lot of time and effort in it to make it kind of self-explanatory, but i wasn’t too sure about it. If anybody knows of the existence of other implementations, please let me know! This is really fantastic! Just what I’ve been looking for for the past couple of weeks! Thank you for your massively interesting links!! I saw that you’ve had music lessons from David Rowland, i was a student of his as well, very coincidental wouldn’t you say? Please let me know if you need any help implementing the midibridge. Nice work — I’m really impressed. We have a desktop app that helps people learn to play the piano, and we’re looking to move the MIDI input to a new system. We can’t use a browser or Adobe Air, but we do use a SWF wrapper (Zinc) that lets us launch external executables and also make calls to the system using shell scripts. Is there a way to modify what you created for Air and use shell scripts to connect to the midibridge instead? We’ve done tests and can launch the bridge using Java, but we’re not sure how to connect to the bridge and get input from the MIDI device — to basically addListenerEvents like you’re doing with the Air version. Thanks for any tips. And thanks again for great tool. But i am afraid that these methods don’t provide the possibility to pass arguments to the process after it has started. The documentation tells explicitely about the method mdm.Process.setParams() that it should be called before mdm.Process.create(). However you have to start the midibridge process first, and then when it runs you need to be able to interact with it by sending parameters to the stdIn of the process. Also i don’t see a possibility to listen for messages coming from the stdOut after the process has started: only when you start the process it returns the stdOut, as the name of the method execStdOut() already suggests. I think in your case a midi socket server like flosc would be a better solution. Hope this helps you a little further. Please feel free to ask me any further questions. I’m really amazed by all the work you have done to accomplish this project; it’s unique, I love it! I have one question. When you’re gonna add the “playMidiFile(url)” function? I just need a simple midi player for flash. Thanks in advance, and once again, GREAT WORK! playMidiFile(url) will probably be implemented late 2011, early 2012.
what i want to know is can midibridge accept a midi stream from a midi server? You could try Lawrie Cape’s midi server. Great Library. I am getting an error in the firebug console when I try to run our flash example. Not sure what to do at the point I have copied text from above. Hi I was able to get it working. But now I have another question. How could I get flash to trace the midi note number of the key that was pressed? I am assuming I need to use getNoteNumber(midiName,octave) but am not sure what to pass as the arguments. I understand how that works now, but am still a little confused about how to implement it in flash, if for instance the user pressed C4 on their keyboard how could I trace 60 in flash? Other only way I can see to do it is to substring this midiEvent.toString() when it traced in flash. Could you tell me how to trace the midi note number in Flash, when a user presses a key on their keyboard? I can hire you for a quick consultation if I need to. Hi James. I am also having this same issue. Were you ever able to get it resolved? @Mac: which version of the MIDI bridge are you using? Hey thanks for the reply. I was able to achieve the results I was looking for by doing all of my logic in an external AS file hooked into the library. I was making the mistake of trying to perform the actions in the timeline code. I’ve been using your library as part of my senior thesis project in university (I’m a digital design student), and I couldn’t be happier with how this API has worked out. Thank you so much for this. Very cool work! Is your project online? If so, can you share the url? Love this and could be exactly what I need. Bit of a noob question here, so apologies if this has been covered in the documentation. I would like to be able to use a MIDI keyboard to trigger some samples on a webpage. For example if the user presses A4 on the keyboard a pre-recorded sample will play or possibly a sine tone at 440Hz. I have it working in so far as the MIDI message pops up on the bottom of my web page. I haven’t been able to get that working. I can’t seem to get access to midiEvent or midiEvent.noteName in order to manipulate or use the value. I have tried using this method and also the .indexOf method to search the String of the midiEvent. Am I doing this right? Is there another way to acces the data for the note name? There may be something fundamental I am missing. This looks really interesting! but I have run into a problem trying to get this to load. I downloaded your example zips and some of them seem to work, bit weird but I have a starting point now! Great! Can you tell me which examples don’t work? then it doesnt fire but if i call it as the function for a click event then it seems to work. Yes, that is correct: you have to wait for the ‘ready’ event. I’ve even tried with JS in absolute links (http://abumarkub.net/midibridge/examples/js/regularkeyboard.js…..) >#fail Any idea ? Let me know if you run into troubles. But even the non-deprecated version there is out of date. Just install the contents of the zip parallel to your own html file. A small problem: The regularkeyboard.js example is still not working, either here or on my site. All examples have been updated, both on this site and in the coderepositories (Github and Google Code). Also, the midibridge has been updated to version 0.5.2. Thanks for reporting the issue with connectAllInputsToFirstOutput on Github; this bug has been fixed as well. OK, last ressources loaded (0.5.1) In the ‘MIDI’ dir on my webserver I have the ‘keyboard.html’ file – which calls ‘midibridge-0.5.1.min.js’ and ‘regularkeybord.js’ – and the ‘midiapplet.jar’, all these files at the same level in the same directory. Noob question: do I need a MIDI-server (or any special serv config) or any HTTP webserver is supposed to work? regularkeyboard.js is now working, but one has to activate the screen first (by giving it a click). There seem to be undocumented functions in MidiBridge.js. For example, midiBridge.loadMidiFile() and midiBridge.playMidiFile(). Presumably these are “reserved” and not implemented yet. Are there any other things that are not yet implemented? Is there a better place to ask things like this? For example on Github? Yes, that is normal behavior: the browser window needs to have focus before it can respond to keyboard events. If interested I’ll post here my project once fully developped in a couple of monthes, an urban experimentation with geolocated people tracked to produce a sound creation event. Thank you for your great effort. I’m building a site for midi file exchange and would like to add ability to preview files online. Playback is fine but in the data callback I get events only for one channel. I’m getting the same result when running playmidifile example,- only events for the first channel are displayed on the screen. Am I missing something or multi-channel files are not supported in this version? It should work with multi-channel files as well; I am going to look into it and get back to you asap. Any way to use this on an iPad? I do not even know how I ended up here, however I thought this post was great. Cheers! I highly doubt it, but since you’ve been working on this, I hope you’ll be able to give me a definitive answer. I guess I’ll wait for the w3c guys to put Web MIDI API on prod. In the meantime I think I’m gonna use your API with the java applet. This is a fantastic solution! I was looking for a way to get track names out of Native Instruments Traktor Pro (DJ Software). Midibridge would perfectly do the job. Unfortunately I can’t see any MIDI output on the console. Nevertheless I can hear the sound when I connect in- and output and play any note on a virtual piano. Any idea why this happens? I’m using Firefox 14.01. I added an alert() statement in the “printMIDIMessage” function, but it does not appear. So the callback seems not to be called from the plugin. I would greatly apreciate your help! First, thank you for this library ! Now, is the sequence parameter of createMidiMessage working ? but even if seq is non-zero, the msg is sent immediately… Maybe I misunderstood the role of the seq parameter ? Doesn’t it delay the message actual triggering ? Have you some tutorial for C# (or VB) Silverlight Gui midibridge functions ? No, sorry I don’t have any examples for C#/Silverlight. This is a great resource – very straightforward information about a very useful library. Thank you! Can you provide any more information about the System_Exclusive static member? I’ve managed to connect to a LoopBe port and send NoteOn information with SendMIDIEvent, but I need to be able to send SysEx strings to control external equipment. Is this supported by way of the System_Exclusive member, or is that read-only? Which version of the MIDIBridge are you using? Did you ever get round to adding a “RecordMidi” feature? I would love to be able to record the midi events to a .mid file which I can save to my system. Also is is possible to change the tempo of a midi file loaded via the sequencer to playback slower/faster? as that would be ideal for what I have in mind! Actually, I am working on a new library that does all that. I strive to release it mid November. Perhaps you can help me? I have a synthesizer plugged into my PC and I am trying your examples with sendMidiEvent… no matter what channel I choose I am getting a piano sound… possible not even through my synths midi input. How do I choose which device to output to? I’d like to be able to select a voice on my synth and have it play in that program when I hit the button depending on what I have selected on the hardware. Hey admin! First of all thank for sharing this! You are awesome! I was wondering if there is any JS function to send the same midi event to all the keys/ buttons / knobs on the midi device. Im using sendMidiEvent to each button on the midi device and its massively lagging. (This function happens several times per second) Thanks ! I am afraid I don’t understand what you mean. Do you mean you want to send control change events to your hardware? It seems however that the latest java interpreter requires that jar web files be ‘signed’. Do you have plans to sign the jar file? Thanks! You are right, the .jar needs to be signed. You can sign the applet with a self-signed certificate, which is free. I can send you the Java code if you want. But maybe it is better to use the Jazz plugin? Also Chrome and Chromium have already implemented the WebMIDI API. Thanks so much for the speedy reply! I have the Java code from github, but I can sign the jar file directly (I think) and don’t need to recompile. I have a website that compiles Lilypond code into PDFs and midi files, and it’s important that first-time newbie users can hear midi right away with the least hassle on their part. Installing jazz-plugin is an extra step that I would like to avoid (at least for the new users). Well, it won’t run with a self-signed cert “java blocked an entrusted application” or something like that. Geez, MIDI came out in 1983 – but it’s the hardest thing to get up and running in browsers!